So I must admit, we are a pasta loving family. Pasta is a wonderful base because you add so much to it. It’s almost like a blank canvas. Throw in some veggies, a little meat and a yummy sauce and you have the perfect one-bowl meal. Since we eat a lot of pasta, I have been looking for some alternative and healthier versions rather than the typical white pasta. We eat quinoa spaghetti quite often and the kids like it especially if it’s topped with pesto or my bolognaise sauce. I have always wanted to try whole-wheat or whole-grain pasta but was worried how the kids would react. I aim to make one meal (no short order cook here) for dinner and I want us all to enjoy it so I have to always think about what the kids will really eat. Luckily my kids are not super picky eaters. They eat a variety of foods because we serve them a variety. You have to set an example as a parent and if you’re not eating veggies or trying new things then your kids will not do it. I found this recipe at Cooks Illustrated and was excited to try it as it incorporated 2 things that I have never used before, whole-wheat pasta and fennel. I have eaten fennel before, but have never cooked with it. 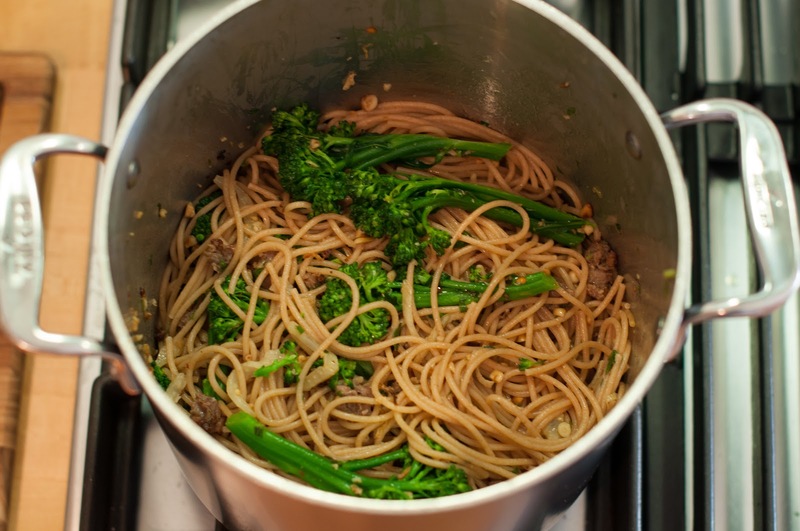 We have a veggie every day so I wanted to add some blanched broccolini to our pasta. You don’t have to add broccolini to this dish, but it really is the perfect vegetable to serve with this type of pasta and makes it a one-bowl meal, and who doesn’t love that. This pasta is a wonderful combination of flavors. The sausage adds a certain spiciness (not to spicy though) to the dish and the pine nuts add a nice crunch and buttery flavor. 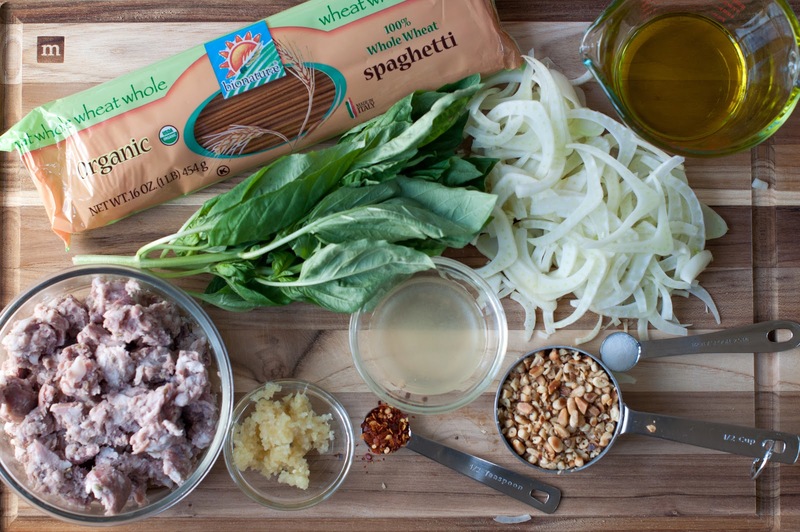 The whole-wheat pasta has a great nutty and salty flavor and it’s chewy, but in a good way. It doesn’t taste grainy at all. I have had this for leftovers the past week and it gets even better with age as all the flavors have a chance to mesh together. This is a photo of the leftovers that I had for lunch. 8-12 ounces sweet italian sausage, removed from casing – I actually just buy up a 12oz package of my favorite sausage links. 1/2 cup pine nuts, toasted and coarsely chopped – I always toast these up ahead of time. 1 pound whole-wheat spaghetti – Cooks Illustrated recommended Bionaturae Organic 100 percent whole-wheat spaghetti because of it’s nutty flavor and chewy texture. We really loved this pasta. It always makes cooking easier when you get all of your ingredients out and prepared ahead of time. You will need to have everything prepped for this pasta as things move fast. Slice up your fennel (see how-to instructions below), toast and coarsely chop your pine-nuts, (I do this earlier in the day or even the day before) juice your lemon, mince your garlic, remove the sausages from their casings (I usually do this the day before or earlier in the day) and rinse up your broccolini. Note: Wash and dry your basil but do not chop it yet. Chop the basil at the last possible moment to prevent it from discoloring. 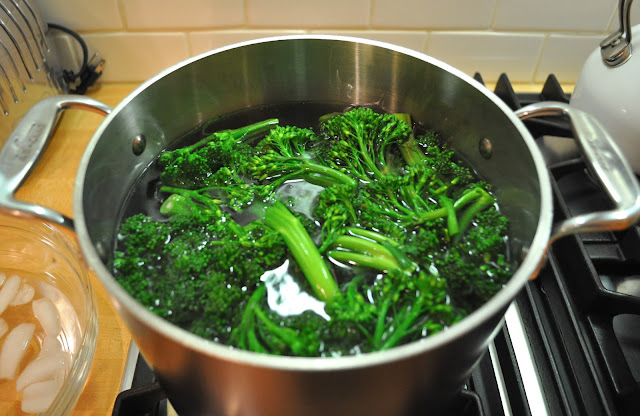 Bring a medium pot of well-salted water (you want it to taste like salt water) to a boil for the pasta and the broccolini. 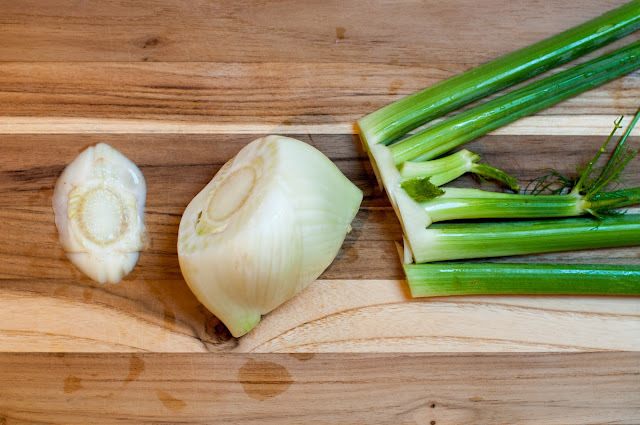 Wash up your fennel, cut a little slice off of the bottom of the bulb and then cut off the fronds right next to the bulb. If the bulb has some dark marks on it then take a vegetable peeler and peel off those marks. 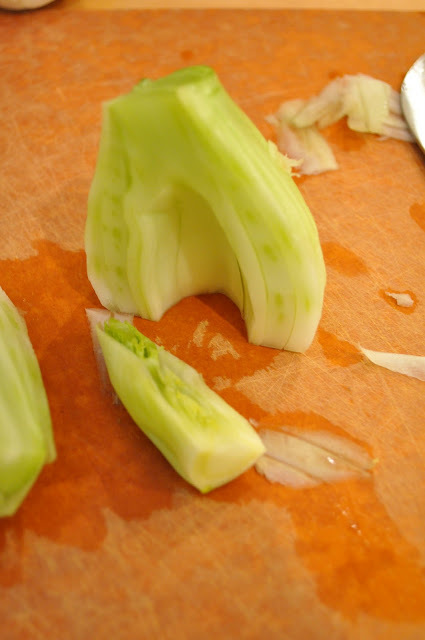 Cut your fennel bulb in half. Cut out the inner core. Lie the fennel bulb down on its flat side and just slice the fennel crossways. Don’t know how to toast pine nuts? To toast them, just put some raw pine nuts in a dry skillet and swirl them around in the pan (over medium heat) for a few minutes until they become golden brown in color. Remove them from the pan and set aside. Coarsely chop them when they have cooled a bit. 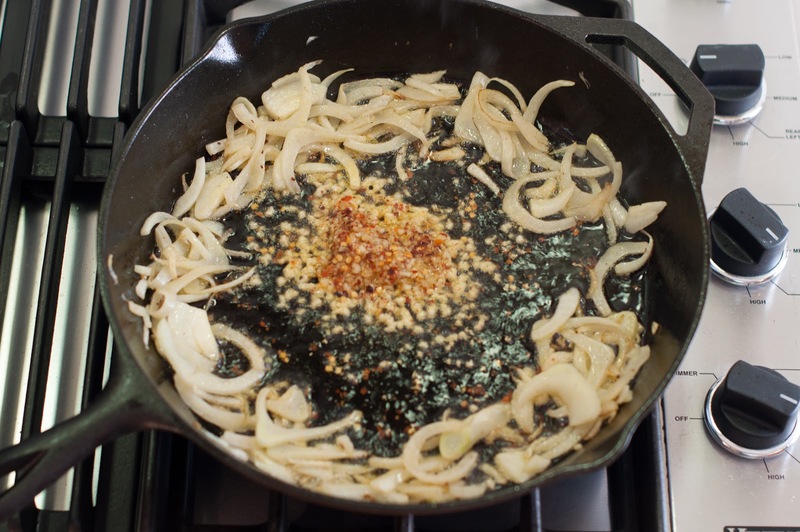 Combine oil, minced garlic, 1/2 teaspoon red pepper flakes and 1/2-teaspoon salt in a small bowl: set aside. Once the water has come to a rapid boil, throw in your broccolini and cook until just tender, 1-2 minutes, depending on the size of your broccolini. Note: Timing can vary depending on the size of your vegetable. There is only one sure way to tell if your vegetable is done: put it in you mouth and eat it. Transfer broccolini to a bowl of ice water with a slotted spoon or mesh one like I have. 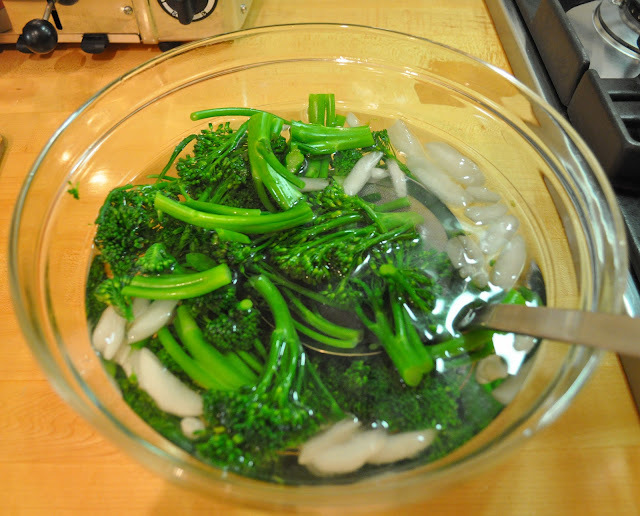 Drain and dry the broccolini; set aside. Bring the water back to a rapid boil and cook the pasta until al dente. Reserve 3/4-cup pasta water; drain pasta and return to pot. Heat sausage in a 12-inch skillet or large skillet of your choice over medium-high heat; cook stirring to break up sausage into 1/2-inch pieces, until browned and crisp, 5-7 minutes. 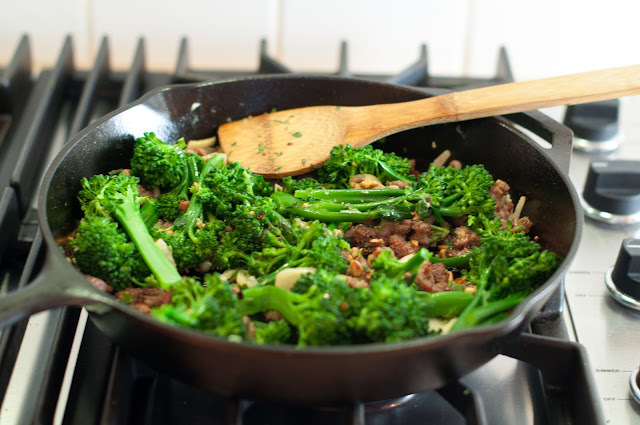 Cooks Illustrated recommended a non-stick skillet. I used my cast iron skillet which is virtually non-stick and I have also used a regular skillet before and it worked great. 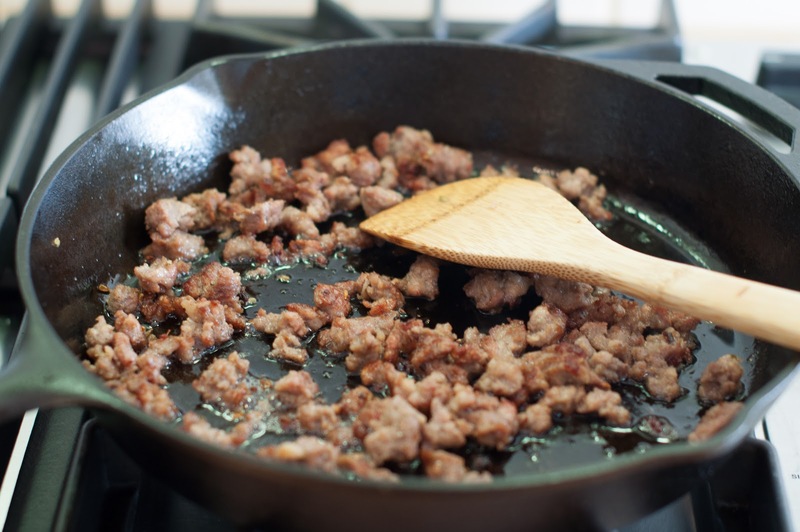 Using slotted spoon, transfer sausage to towel-lined plate, leaving rendered fat in the skillet. 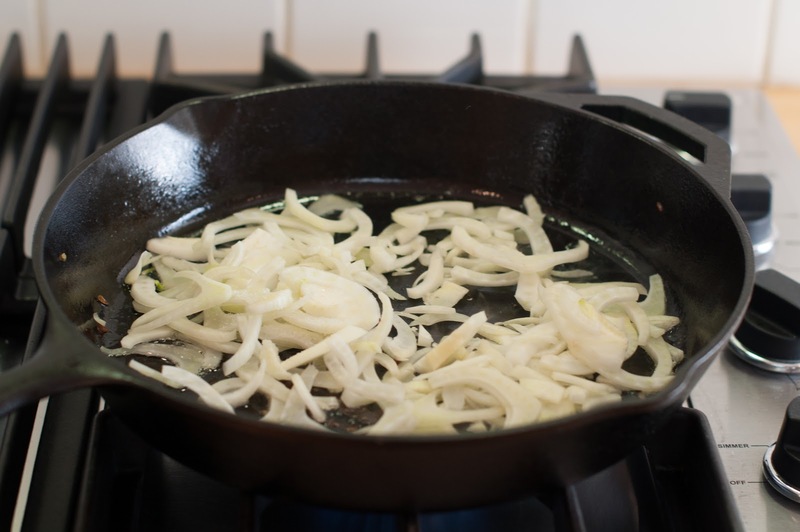 Return skillet to medium-high heat; add fennel and 1/4-teaspoon salt, and cook, stirring frequently, until fennel is tender, about 5 minutes. 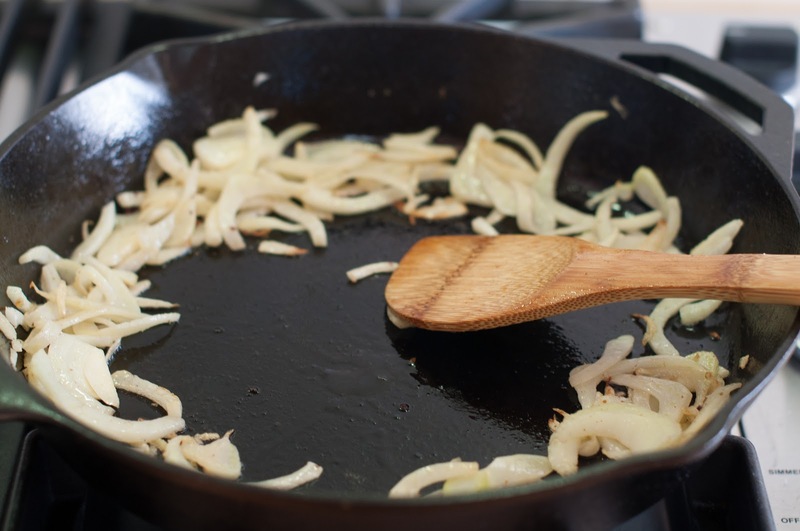 Push fennel to sides of skillet so you have a 3-inch clearing in the middle of the pan. 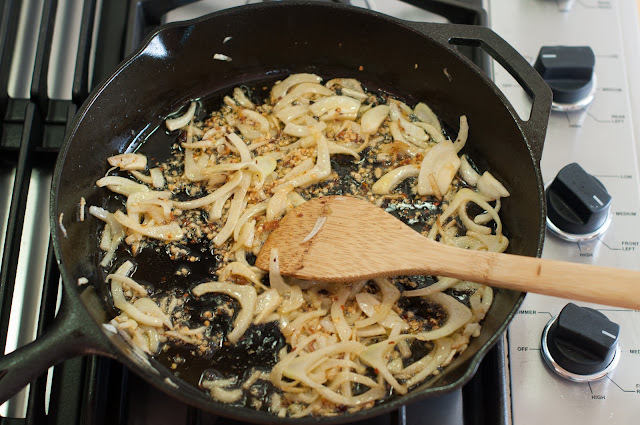 Add the oil-garlic mixture and cook, stirring constantly, until fragrant, about 1 minute. 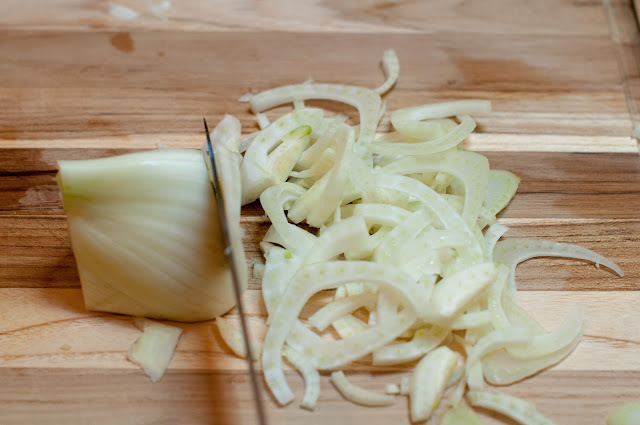 Stir to combine garlic mixture with fennel and cook for 1 minute longer. 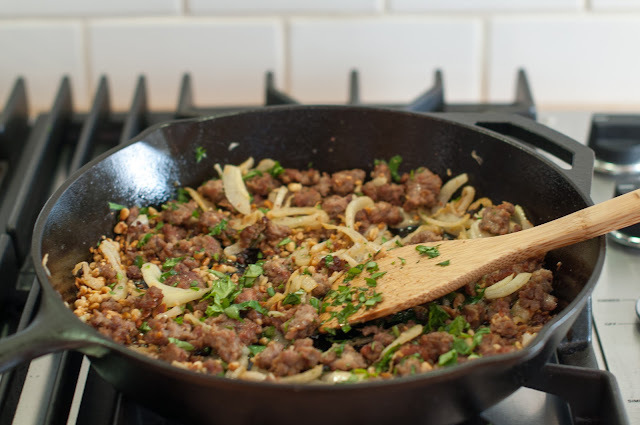 Remove skillet from heat and stir in sausage, pine nuts, basil and lemon juice. Add the fennel sausage mixture and the reserved cooking water to pasta, toss to coat. Serve up the pasta into individual bowls and top with some fresh pecorino romano cheese. The pecorino cheese was recommend over parmesan as it adds a bit of a salty tang to the pasta. It really is the perfect compliment. I am hooked on this combination and look forward to trying other sauces with whole-wheat spaghetti or other whole-wheat pastas. BTW, you probably want to know the kids rating on this dish right? Zoe rated it a 9 and Eli rated it a 10. John and I rated it a 10 plus. 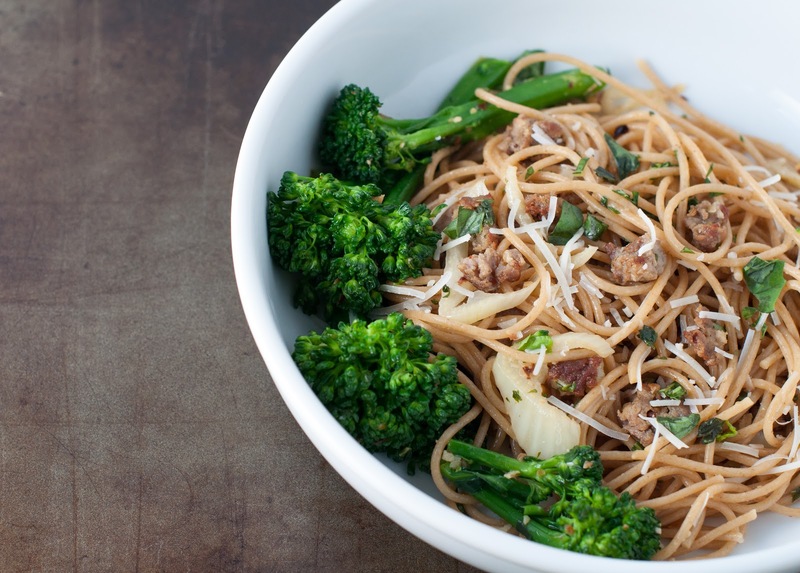 Have you ever tried whole-wheat pasta? If so, what was your take on it? Happy Fennel Friday! We love this recipe and it is featured on our Pasta and Fennel Recipes! Thanks! Yay, a fennel pasta recipe! I’ve been going crazy for fennel lately. I’m not a big pasta fat generally (sacrelig I know) BUT when I do eat ti I actually prefer wholewheat – it seems to have more flavour and is so much more sustaining. Im also currently trying to reign back my sausage consumption (meaning I usually save it to have as hot dogs with saurkraut – yum! ) BUT This does look so delicious. I love italian sausage and fennel and this looks like a perfect meal to have with hubs on a Sunday lunch. Hmmmm. Hi Em! It’s funny because some people are not carb fans. I am definitely one of them and always have been. Believe it or not, I have grape nuts everyday topped with Cafe Fanny granola or Go Lean Crunch. I have been eating grape nuts since I was 16! Creature of habit and a carb girl! I am not the biggest meat fan nor sausage, but my kids love meat and so I do have to create dinners that appeal to them. I try and keep every Monday a meatless Monday and have 2 other meatless days during the week. I may feed them meat, but sometimes I abstain and eat a plateful of veggies or a have 2 bites of meat with my dinner. Going to make your chicken dish this week and we had your tuna for lunch last week. Yum! This looks wonderful. I loved the Lemon Chicken Breasts too. It was so flavorful and tender. It is a family favorite now, thanks for sharing. I am looking for white dishes. I love the one you show the whole wheat spaghetti in. Could you tell me where you found those? Hi Jill! I am so happy you loved the lemon chicken dish. It’s funny but that has been my most popular recipe of all time (I’ve only been doing this blog since October, so it’s not that long). Try the tarragon chicken next if you like the lemon chicken, it’s wonderful and my kids loved it! Do you have a sur la table near you? That is where I picked up those gigantic pasta bowls. The portions look small because the bowls are so big. The bowls are great because the kids have lots of room to eat their pasta and everything is not all crammed in there. I am actually going to William & Sonoma today to pick up some white dinner ware as my plates are past their prime. I will see if they have any nice white pasta bowls. The current set I am looking at is fairly inexpensive and it’s made in France not China! Yippee! What a great combination of flavors & textures – I am loving this dish. Thanks Pam! I love your linguini with turkey italian sausage & arugula dish. This is a recipe right up my alley! I love Italian sausage with fennel and red pepper flakes and I love fennel itself, but somehow I never thought to put fresh fennel in pasta sauce. I will now. Thank you. I love whole wheat pasta and snap it up whenever I find it on sale. Thanks Sharyn. I loved this recipe as well and all the different flavor combinations. I never realized how delicious whole-wheat pasta can be. It’s got a texture to it that really appeals to me. Let me know how it turns out for you when you make it.